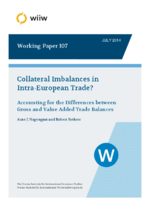 One of the main stylised facts that has emerged from the recent literature on global value chains is that bilateral trade imbalances in gross terms can diﬀer substantially from those measured in value added terms. However, the factors underlying the extent and sign of the diﬀerences between the two measures have so far not been investigated. Here, we propose a novel decomposition of bilateral gross trade balances that accounts for the diﬀerences between gross and value added concepts. The bilateral analysis contributes conceptually to the literature on double counting in trade by identifying the trade ﬂow in which value added is actually recorded for the ﬁrst time in international trade statistics. We apply our decomposition framework to the development of intra-EU-27 trade balances from 1995-2011 and show that a growing share of intra-EU bilateral trade balances is due to demand in countries other than the two direct trading partners.